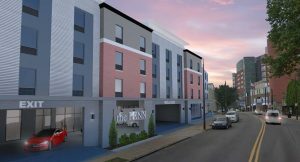 A new 115-room Hampton Inn hotel is being built at 4520 Penn Ave. The development team of M.P. Kratsas is appearing before the city’s Contextual Design Advisory Panel (CDAP), which has requested the community’s comments prior to the CDAP review. Bloomfield Development Corporation will not provide an opinion without first hearing from the community of residents and business/property owners, so we are convening a community meeting for that purpose. As part of our community process for new developments, we invite you to a community meeting on Monday, February 19th at 6:30pm at the West Penn Hospital School of Nursing (4900 Friendship Ave., at the corner of Gross & Friendship) to hear a presentation from the development team and to ask questions.